Peggy was admitted to The Enclave at Rye Rehabilitation and Nursing Center on July 18th, 2018 from Montefiore Medical Center, following an inpatient hospitalization due to bilateral lower leg edema. Shortly after her arrival, she was warmly greeted by members of the interdisciplinary team, including the nurses, therapists, and doctor. Cynthia, her physical therapist and, Tim, her occupational therapist, met Peggy and performed their initial evaluations as well as preliminary goals. She presented with muscle weakness, decreased standing balance and activity tolerance, and limited standing duration of under one minute, severely impacting her ability to independently perform basic activities of daily living (ADL’s). Performing transfers in and out of bed and bed mobility required the extensive assistance of two, in addition to experiencing intense pain. Short term goals were established to help her regain strength while nursing carefully monitored the pain levels so that she could maximize her time in therapy. While the nursing team provided care to limit pain, the therapy team also utilized its array of tools to minimize pain, including the use of Diathermy prior to therapy sessions. Two weeks into her stay, Peggy realized she was making progress. Her standing duration increased to between one and three minutes. New goals were set to three to five-minute duration, while she could perform transfers in and out of bed with the assistance of one. The feeling of independence in the air gave her the incentive to continue working hard. Five weeks after entering The Enclave, Peggy was discharged back home with renewed strength and independence. Her standing duration reached over ten minutes, allowing her to perform ADLs such as dressing and personal hygiene. She could safely walk 200 feet with a rolling walker and could perform functional transfers with an assistive device. Marie was admitted to The Enclave at Rye Rehabilitation and Nursing Center on May 21st, 2018 from Greenwich Hospital following multiple falls over the previous months, which resulted in a pelvic fracture, a fracture to her right upper extremity, and extreme weakness. The interdisciplinary team, comprised of the nurse manager, social worker, therapists, and doctor, warmly welcomed her to the community. Due to Marie’s recent history of falls, Liby the nurse, put in place fall precautions to prevent further accidents in addition to offering ongoing education to remind Mary of the need to be extra cautious. Liby also coordinated with the therapy team to ensure pain management was implemented into her therapy regimen. Robert and Tim, her therapists, performed their evaluation shortly after her arrival assessing her right arm as non-weight bearing with 7/10 level intensity on the pain scale requiring extensive assist of two for functional transfers and mobility, as well as extensive assist of one for dressing and bathing, and minimum assistance of one for feeding. After two weeks of steady progress, Marie had gained strength which allowed her to participate in functional transfers, no longer needing assistance of two. 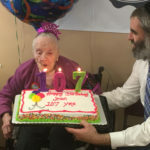 She also experienced less pain in her arm, allowing her to maximize time in therapy for mobility and ADL’s (activities of daily living). One week into June, however, this progress was slowed as a Venous Doppler scan showed Marie was positive for DVT (deep vein thrombosis) in the right leg. After she was assigned medication, the interdisciplinary team was notified to allow her to participate in therapy, though at a moderated pace. With her eyes set on returning home, Marie continued to make steady progress. Following an orthopedic consult mid-way into June, her right arm was revised to weight bearing status, allowing her to begin strengthening her arm and to begin performing ADL’s on her own. 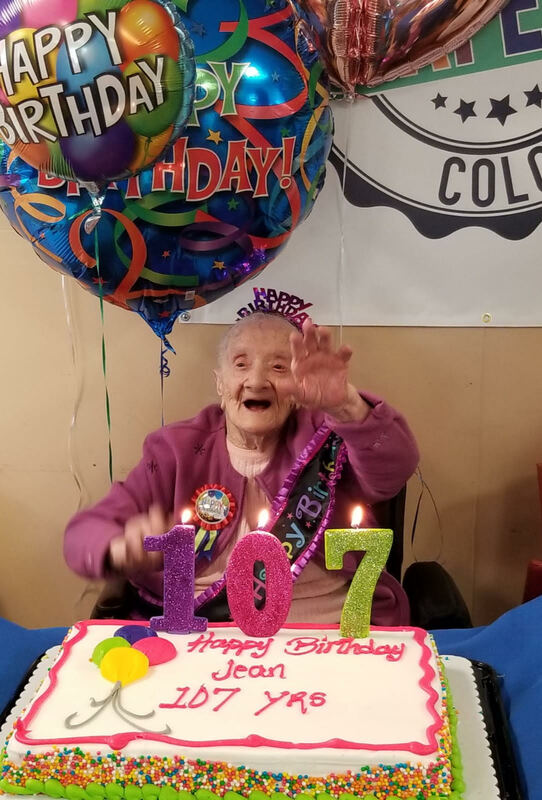 At this time, she could safely ambulate 100 feet with a rolling walker and standby assist and could transfer in and out of bed with contact guard assist. She could also perform ADL’s with contact guard assist and could eat independently. Marie is set to be discharged shortly looking much happier and independent than when she came to the community. She can now safely ambulate over 300 feet with a rolling walker and can perform functional transfers independently. She is thrilled to once again be able to care for herself, including dressing and hygiene, as she has increased her strength to be able to perform ADL’s while standing. 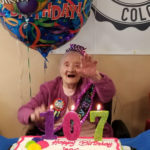 Equally important, she has gained a greater understanding of her strengths and limitations, greatly improving her safety awareness to keep her home and active. 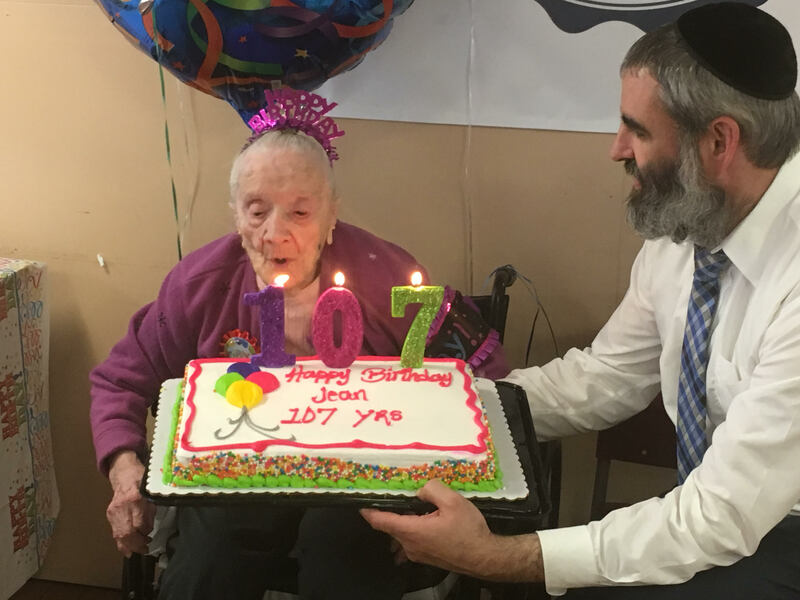 Posted in News and Events	| Comments Off on Celebrating 107 Beautiful Years! Caroline came to The Enclave at Rye Rehabilitation and Nursing Center on April 9th, 2018, from White Plains Hospital following an inpatient hospitalization due to edema of her lower extremity caused by cellulitis. With a history of congestive heart failure (CHF) exacerbating her condition and slowing the healing process, she experienced a significant decline in her functional capabilities requiring rehabilitation to increase strength and return to her fully independent self. After being greeted by the nurse manager and social worker, Caroline met with her therapists who would be assigned to her throughout the duration of her stay. She was assessed as requiring extensive assist of one for bed mobility and transfers, extensive assist of one for dressing and personal hygiene, and an unsteady gait requiring assistance of one for mobility. This change in her status was a challenging position for Caroline and she was eager to return to the community independently. Cynthia, her physical therapist, incorporated a pain management regimen into her exercises to ease the pain Caroline was experiencing, particularly during exercise, so that any pain she might encounter would not limit her ability to perform daily functional activities and move around. Short term goals were established to improve her strength and endurance and to perform ADL’s (activities of daily living) with as much independence as possible. With the nursing team caring for the edema, Caroline was able to focus all her energies on the ultimate goal of getting home. Over the course of the next five weeks, the pain was managed effectively to reach a low of 3/10 on the pain scale, allowing Caroline to regain her independence and prepare for a safe discharge back to the community. Her endurance had increased to nearly 30 minutes, allowing her to perform all ADL’s, such as toileting, bathing, and dressing independently, without needing consistent breaks. She could independently perform all transfers and bed mobility and could walk 150 feet with a roller walker allowing her to get around the house without needing a rest. On May 14th Caroline went back home to the community functioning at her former levels. We are proud to see Caroline’s progress throughout her stay here at The Enclave. We wish her the best. Maureen came to The Enclave at Rye Rehabilitation and Nursing Center on April 21st, 2018, from Phelps Memorial Hospital following a flare up of chronic obstructive pulmonary disease and chronic hypoxic respiratory failure. She was presented with shortness of breath on 2 liters of oxygen via nasal cannula, alert and oriented, but weak and limited in her functionality. A weekend admission would not prevent the team from welcoming Maureen to her new community. She was assessed by our doctor, nurses, therapists, and members of administration within 24 hours of her arrival, which she found reassuring and made her feel safe. She was assessed as having general muscle weakness affecting her ability to independently perform activities of daily living (ADL’s), and would quickly become fatigued when performing even moderate ambulation with her rollator walker. She scored a 14/28 on the Tinetti assessment, indicating a high risk for falls. 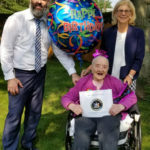 The therapists outlined her primary goal as being able to safely transfer in and out of bed and to have the strength to perform ADL’s while standing, so that she could use her wheelchair for lengthy ambulation. Her physical therapist, Cynthia, guided her with safe transfer practices while working on increasing her strength and safety awareness training. Ten days into her stay, Maureen could better position herself to walk 50 feet with contact guard assist on a rollator walker and could transfer in and out of bed with standby assist. Toileting and hygiene could now be done with modified independence using a supportive device, while lower body dressing could be done with contact guard assist. During her stay, Maureen was thrilled to take advantage of some of the community’s perks, such as the iPad, which she could use in her room, as well as the company’s complimentary car service, which allowed her husband, who no longer drives, to come visit and spend time with her. This complemented her therapy sessions by ensuring she had an overall exceptional environment conducive to recuperating and keeping her at ease. On May 21st, Maureen was discharged back home, smiling at the quick turnaround and great success she had during her stay. She could safely climb 12 steps, could transfer out of bed independently, and could also get in and out of a car independently, giving her back freedom to move about the community. Her fall risks had decreased significantly, and she could safely ambulate on her walker 150 feet with supervision. Additionally, she could perform ADL’s such as dressing, bathing and hygiene with occasional set up assistance, giving her back her independence to function as she used to. We are so proud to see the amazing progress she made during her time at The Enclave. John was admitted to The Enclave at Rye Rehabilitation and Nursing Center on January 16th, 2018 from Helen Hayes Hospital. He had been recuperating since mid-December following an injury to the head, which was exacerbated by acute pneumonia, leading to anoxic encephalopathy leaving him severely compromised. With a long road ahead of him, the comprehensive nursing team and members of the administrative staff welcomed John to ease his transition into this next chapter of his recuperation. The nurse manager Liby, met with John to assess his progress and ensure proper care would be administered as necessary. She carefully examined his tracheostomy and PEG tube site’s, which still needed attention following their being discharged shortly before his coming to The Enclave. The speech therapist, Mike, performed his assessment to improve cognitive-linguistic skills and communication abilities along with the physical and occupational therapists. Short term goals were set to increase independence with ADL’s to moderate assist for toileting and transfers and contact guard assist (CGA) for hygiene. John began regaining his strength to perform tasks more independently and succeeded in reaching his short-term goals one week into February. He was able to perform hygiene care with CGA and lower body dressing. The next set of goals was targeted to get him increasingly independent without assistive devices, as he had been prior to his initial hospitalization. At the end of March, John was once again performing all ADL’s, including toileting, self-care, and dressing independently. Regaining the strength needed for climbing stairs and walking unassisted took more time with the physical therapy team. On April 9th, John was discharged back home a reinvigorated person. Indoors he could ambulate entirely independently, while he would use a straight cane when walking outdoors. He could climb more than 15 stairs unaided and had improved from a mid-March Tinetti Assessment of 15/28, indicating high risk of falls, to 24/28 indicating a significant decrease in risks for falls. He could perform functional transfers independently. John was escorted out walking independently anticipating his return to living independently. It was an honor to assist John in his recovery at The Enclave. Harry was admitted to The Enclave at Rye Rehabilitation and Nursing Center on January 23rd 2018 from White Plains Hospital following the amputation of his left foot due to his history of spina bifida and chronic osteomyelitis of the left foot. The interdisciplinary team, including the nurses, therapists, and administrative team warmly welcomed him to this new environment, making him feel comfortable. The nursing team evaluated Harry’s wound, with the goal of ensuring a safe healing process while also controlling for pain, which was 7/10 on the numerical pain scale. He would need therapy to improve his strength, endurance, gait and balance to improve his functional mobility in addition to preventing the risk of future falls. Harry was immediately informed about The Enclave’s Comprehensive Amputee Rehabilitation Program, led by Todd Schauffhauser and Dennis Oehler, both paralympic amputees, who provide additional support and training to amputees. Marlene, the physical therapist, established short term goals of Harry being able to perform all functional transfers independently, an improvement from his current moderate assist of one. Increasing strength and endurance on the right foot required additional measures of support, as Harry was experiencing pain on his right ankle. To ease the pressure he was given an ankle foot orthosis (AFO) to aid in supporting the additional weight not being carried by his left side. These measures helped to improve his mobility so that he was independently transferring in and out of bed and to his wheelchair one month into his stay. Due to certain issues surrounding the nature of the amputation, there were complications in properly setting his prosthesis slowing the process of beginning to walk with one. The therapy team coordinated with nursing to ensure he could tolerate wearing the prosthesis, without feeling any pain, swelling or redness for extended periods of time. While initially ambulating with a rolling walker by hopping, on March 19th Harry took his first unassisted steps with his new prosthesis. Todd and Dennis met with him to provide additional support and training for safety awareness and proper gait with the prosthesis. The renewed energy of walking independently has been evident on Harry’s face since that day, as he continues to progress towards walking on his own once again. 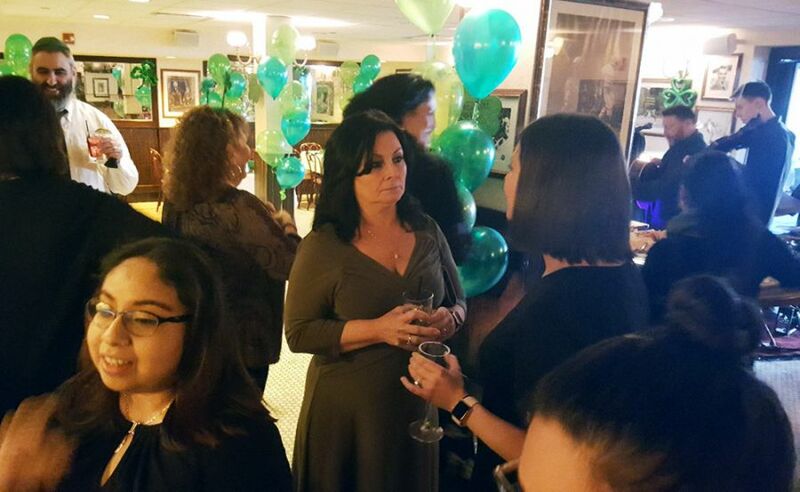 Continuing our annual tradition, The Enclave hosted a fantastic St. Patrick’s event for case managers to come and enjoy the night out. 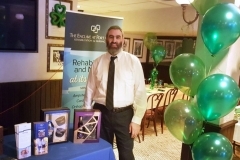 A local Irish band entertained the crowd and a few lucky raffle winners took home great prizes. Can’t wait for next years party! 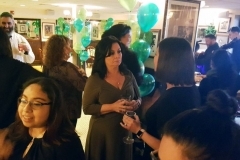 Posted in Events	| Comments Off on Celebrating St. Patrick’s Day! Phil was admitted to The Enclave at Rye Rehabilitation and Nursing Center on December 8th, 2017 from Montefiore Medical Center where he was warmly greeted by the interdisciplinary team, including the nurses, therapists, and doctor. 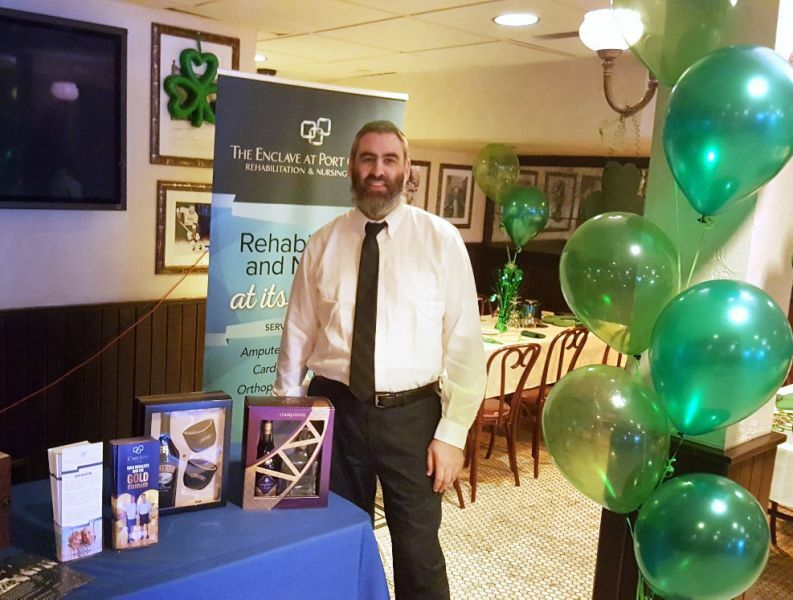 With a history of subdural hemorrhage resulting in hemiplegia and hemiparesis as well as chronic kidney disease, Phil was deconditioned and no longer had the strength to care for himself. The nursing and therapy teams were eager to get Phil back to his independent self. Upon admission, Phil was assessed as requiring moderate assist of one for dressing and hygiene. Due to extensive pain in his left ankle, an 8/10 on the pain scale, he was severely limited with mobility and transfers, requiring use of a wheelchair. 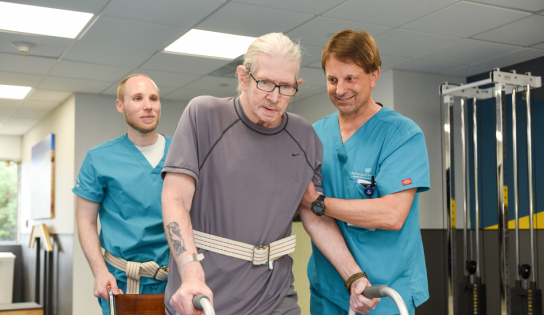 His physical therapist, Tim, recognized his desire to get back home and that carefully working to improve strength and endurance would help to ensure progress notwithstanding the pain. After three weeks, Phil had passed the initial short term goals set for him. He could walk 60 feet with contact guard assist on level surfaces and could perform transfers with standby assist. He had also made great strides in occupational therapy, being able to dress himself under supervision and he could perform functional mobility during adl’s while using an assistive device. Climbing steps would be the next high bar for him to achieve in order to be able to get into his house. With the steady progress and encouragement from the staff, Phil was excited to take on the next challenge. On February 1st 2018, Phil was discharged back to the community, a rejuvenated person with a new outlook on life. The pain had largely subsided and he had been trained to function with whatever pain remained. His static standing without a supportive device was over ten minutes, he could climb the twelve stairs needed to get into his apartment and he could walk over 150 feet independently. Phil had also regained the confidence and drive to care for himself, performing all adl’s independently, including hygiene and dressing. The staff was happy to see Phil going back home a completely invigorated person.